I don’t know about you, but for me the month of July is almost synonymous with the beach. I love to just comb the beach for goodies such as beach glass, driftwood and shells. I also like to collect a vial of beach sand too. What does July mean to you? This kit is just perfect for scrapping your day at the beach, sailing, or just enjoying a tropical drink while WISHING you were doing those things! The collection is sale priced at an amazing 65% off – only $8.55 – for a limited time! The individual pieces are also available and on sale for 40% off. 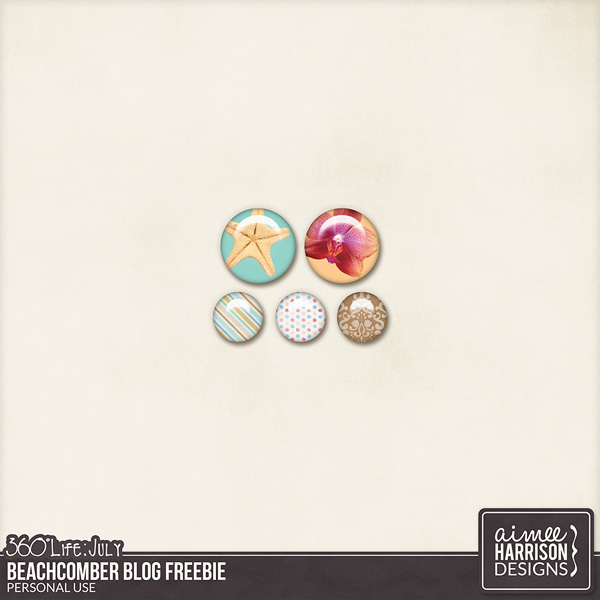 360° Life July: Beachcomber is available at Gotta Pixel, Digital Scrapbooking Studio, and my Personal Store! My amazing Creative Team and I have really enjoyed working with this kit – here’s a little inspiration for you! Here’s a little something just for my fans! You can download it HERE, or by clicking on the image below. Enjoy! Tagged 360Life, beach, collection, digital scrapbooking, Gotta Pixel, sale, summer, The Studio. « BIG Summer Sale! Save 40-65% on everything!